1. Why are they asking me this? 2. Have I put too many readings on the course syllabus? 3. Are they feeling overwhelmed and it’s my fault? 4. Am I contributing to a culture wherein students are overworked and placed under undue pressure to succeed and enter the workforce as soon as possible and never have time for themselves or for play? This was not a good teaching moment. It was, in fact, an instance where I faltered in my current pedagogy strategy as I enter a new semester of teaching: a pedagogy of detachment, of caring less, of embodying more authority and not feeling so beholden to the needs and preferences of each student. Rather than adhering to my carefully thought out teaching principles, I nervously rattled off all the reasons I had for assigning ‘so much reading,’ even though in reality some of those pieces are only a few pages long, and these students are adults, and the readings are important and interesting and diverse and carefully selected. 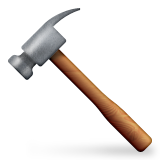 I deploy this metaphor of the hammer in my head whenever I need to give fewer f***s. Aided by this emoji (with the exception of the two-readings question), so far I’ve been maintaining more authority than I have in the past, stuck to my principles more, fought against the urge to externalize the running nervous commentary of feelings and questionings in my head. Past students have written on course evaluations that I am sometimes inconsistent in my assessment standards: I will say one thing in class, perhaps revise proceedings to accommodate the class’s supposed needs, but then not be quite so accommodating in my grading. This semester I am going to try to leave things in the same place where I set them down, as much as possible–hammer them into place, if you will. Paradoxically enough, I think caring (and apologizing) less will earn me more respect as a teacher, so hammering things into place is mutually beneficial. Most people write about the importance of a pedagogy of compassion, of treating students like humans and being sympathetic and flexible when they experience life crises or fall behind on their work. I agree with all of that, of course: undergraduate students, like grad students, are under more stress than ever in this precarious socio-political climate, and we as instructors should be sensitive to the pressures they face. I am not the type of person who could ever be fully detached–even after only a couple classes, I can feel myself growing fond of the students in my classes as unique individuals, and I enjoy joking and chatting with them on a personal level. So in dialing back my propensity for caring too much, I’m just reestablishing balance, fighting against the feminine nurturing stereotype instilled within me, cutting down on draining emotional labour, and attempting to instate a reasonable level of care and compassion while retaining my own authority as an instructor. Yet I know, and fear, that this approach may have its own host of negative repercussions, as this timely NYT article on the “madonna-whore complex” that still tends to persist in modern academia suggests. I guess with this new tactic I’m trying to achieve whatever the word for the aunt-equivalent of “avuncular” would be, an alternative to the girlfriend or mother affiliation: related, yet detached; skin in the game, but not my whole body. I wish more cultural codes existed for this type of persona for women. I wish I didn’t continue to worry that a non-nurturing front will read as overly assertive or abrasive to students, to whom I remain indebted for strong evaluations. I wish I could just enter the classroom and immediately command authority without feeling under scrutiny for my outfit or my hair. I wish things were a little bit easier for us female instructors. Oh Boyda – thanks for this. Thank you both for your comments! Yes, endeavouring not to be a pushover…while still practicing compassion.